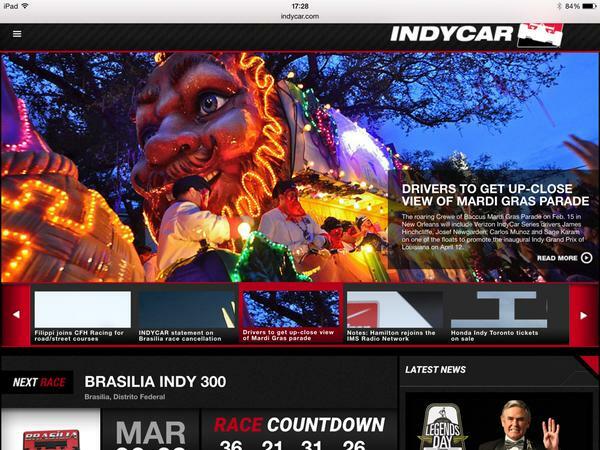 Philip Lane ‏@Re1axinmood - According to reports Brazil is cancelled - @IndyCar could at least update the website. Do they know something we don't? This last full week of January 2015 saw more damaging action in American Open Wheel Racing off the track in two days than most can remember here in the 2010's ... maybe longer. 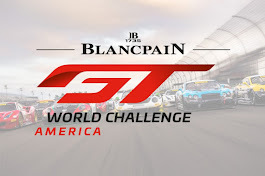 On Wednesday, January 28, it was announced that the committee approach that was implemented last year, which effectively diluted the strong influence of Race Director Beaux Barfirld and prompted the aforementioned Mr. Barfield to resign before the end of the 2014 season and accept a Race Director position at IMSA's Tudor United Sports Car Championship, will remain in place with the once replaced Tony George confidant Brian Barnhart as Race Director. 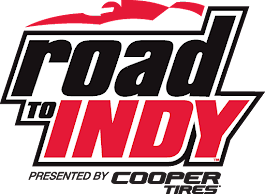 On Thursday, January 29, a shorter season designed to avoid, at all costs, at having IndyCar races being run during American professional football games was made a little shorter with the announcement of the first race of the season set to be run March 8th, 2015, was being cancelled by the race promoter due to track improvement delays and a change of government in Sao Paulo Brazil. In order of actual damage to the sport of American Open Wheel Racing at the highest professional levels, the second announcement was the greater threat, but the image of IndyCar and its professional stability has taken a perceivable step backwards. Races scheduled and cancelled at the last minute tends to speak for itself as it relates to the decision-making powers of upper-management. Stable venues are everywhere and having races run on a consistent basis year-in-year-out helps to build an audience and tradition. Sadly, losing Brazil is just another in a long line of situations that have trashed the year-in-year-out paradigm momentum that has proven to work but is shunned by IndyCar management throughout the years. Further, the re-appointment of, the once replaced, Brian Barnhart as Director of Race Control, when this country has about 330,000,000 (that's 330 million, or 1/3 of a billion) additional human beings living here, shows a complete lack of evolution that would be critical to building and sustaining a sport at its highest professional standards. Lastly, the elephant that still sits in the room (because very little allowable on-track testing has taken place) - the addition of add-on aerodynamic body parts (aero-kits) to the tested and appreciated Dallara DW12 platform which has proven itself to be the only durable element in American Open Wheel Racing. This was to be the year of differentiation through the addition of aero-kits but the actual process has this competitive factor potentially diluted and equalized. All parts have to be manufactured exclusively by Dallara with the majority of the parts already deemed as standard. If the parts are standard to all cars, and manufactured by a single source, secrecy and variance are placed at a minimum. The jury has not even been formed on this season element. Since the news broke less than forty-eight hours ago that Brian Barnhart would be named as Race Director for the Verizon IndyCar Series, there has been nothing but hand-wringing on social media for the past two days. Wednesday morning – John Oreovicz, of ESPN, tweeted out a tease that Wednesday afternoon, IndyCar fans would be told news that would make us think it was either April Fool’s Day or Groundhog Day. I had no idea what it was. I surmised that either the aero kits were going to be delayed or else the opening race at Brasilia had been cancelled. An hour or so after the teasing tweet, Curt Cavin broke the news about Barnhart. I’ve been on Twitter since 2009, and I don’t think I’ve ever seen such a (bleep)-storm as I saw that day. The Legions of the Miserable were out in force. One thing was apparent – IndyCar fans are still very passionate; even in January. I will admit, my initial reaction was not much different from those I was reading – it just wasn’t as strong. I wasn’t horrified like some, but I wasn’t particularly overjoyed either. Like everyone, I’ve taken my share of shots at Barnhart – some cheaper than others. Let’s face it – he’s a very easy target. Most people associate Barnhart with a quick trigger for penalties and a very rigid and inflexible stance. He’s been given nicknames like The Iron Hand of Justice and TGBB (The Great Brian Barnhart). Those detractors are not incorrect in that association, but my bad taste comes from a slightly different direction. Lately, I’ve referred to this current administration as returning to the “bunker mentality” of the Tony George administration. That is what I most associate Barnhart with – that bunker mentality. In the Tony George regime, my perception was that Barnhart was Tony George’s right-hand man and that he really enjoyed being that close to the throne. The two of them pretty much made all decisions, and if no one liked it – tough! To me, it seemed that their viewpoint was “this would be a great series, if we didn’t have all these fans we had to deal with”. When Tony George was ousted in 2009 and subsequently replaced by Randy Bernard in 2010, Brian Barnhart was operating alone without his main supporter. I am not a psychologist, so I don’t know if George’s absence exacerbated Barnhart’s behavior – but it sure seemed that Barnhart’s race officiating became a lot more visible…and more horrendous. To make things worse, the more Barnhart was criticized – the more he dug in. His word was final, and he knew it. If anyone questioned his calls, his resolve strengthened and he turned a deaf ear to the criticism. Fans, owners and even drivers were scoffed at. They knew nothing and should not even be listened to – at least that was my perception. After the debacle at New Hampshire in 2011, it was reported that Randy Bernard had fired Barnhart during the offseason. As it turned out, that wasn’t quite true. He was removed as Director of Race Control, but was still head of Racing Operations. Last year, he was in the rotation to serve as one of three stewards at IndyCar races. [Barnhart's] new title effectively makes him Chief Steward of the total three stewards at any given race. It’s unclear to me if he is one vote of three or the deciding vote. Whatever the case, he no longer has the last word. That now belongs to Derrick Walker, his boss. Once the penalty has been enforced, they can’t really give the positions lost back to the driver. I suppose that remains to be seen. I believe in second chances and all, but I also think that it’s pretty tough to change your core personality. 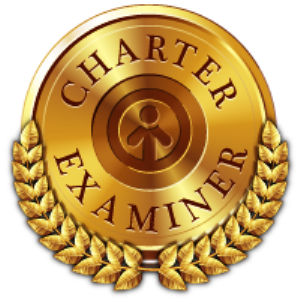 To quote coach Bill Parcells – “You are what you are”. The other night on Trackside, Curt Cavin and Kevin Lee made it a point to mention that even though this is not popular with fans, no one in the paddock is complaining. Barnhart is well-respected there – which is where it counts. I always questioned the integrity of a Chief Steward that had a Twitter account and wanted to be popular. So while I think it’s tough to change your core personality, it can be controlled with hard work and discipline. People do learn from their mistakes. Over time, it becomes easier to control your emotions and resist your natural instinct. Now that Barnhart has returned and we lost the Brazil race, I’m hoping the aero kits are still on deck for St. Petersburg. Stay tuned. I was hoping for Unicorn Jesus. Instead, according to the Internet, we got Osama bin Hitler. Before we fall into familiar, time-honored roles of painting Brian Barnhart as evil incarnate—the fire-breathing hellspawn sent to earth to destroy IndyCar from high atop the Race Control tower, let’s steer the conversation in a direction that involves fewer pentagrams and scribblings of 666. 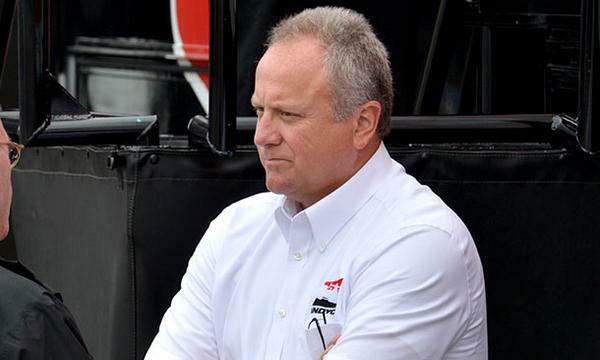 The lows from Barnhart’s tenure as IndyCar’s Race director are well known. From holding an oval race in the rain at Loudon to assigning penalties based on his ability to read minds and judge the intent of the offending driver, Barnhart’s mistakes—and limitations—have been the source of countless columns. In the three years since Barnhart was taken off the frontline, he was retooled as a steward serving the Race Director, and by all accounts, his experience and attention to detail impressed everyone involved. Call it a private, internal career and image makeover, and with those inside IndyCar experiencing the best side of Barnhart, it shouldn’t come as a surprise to see him elevated to his former position. Do I believe, on a personal level, that he has been unfairly targeted and blamed for many things that weren’t his fault? Absolutely. If the best referee is one who acts in the best interest of the game and rules fairly once all the facts are known, you’re left with two more examples of how not to referee. You have the guy who swallows the whistle and calls nothing or, in the case of Barnhart through 2011, the ref who carries a few extra whistles in his pocket because they explode from over-use. That’s Barnhart’s reputation as Race Director. Penalties, penalties, and more penalties, no matter how small the crime, and to compound the problem, his past body of work involved attempts to judge the mindset of the drivers who ran afoul of his sensibilities. The classic case was at Long Beach in 2011 when numerous drivers spun cars from behind in the hairpin leading onto the front straight, but only some were penalized due to the Race Director’s amazing ability to divine intent from genuine error. This little walk down memory lane wasn’t to rehash Barnhart’s checkered past in Race Control, but rather, to illustrate the clear and easily defined pros and cons associated with IndyCar’s new chief steward. Applauded for his body of work from 2012-2014, and worrisome in the latter stages of his first go-round in the position through 2011. It leads me to one conclusion: IndyCar knows exactly who and what they are getting, and if Barnhart is at the center of more controversy due to his trigger-happy shortcomings, blame the series. Simply put: This dog has a history of biting, yet its owners are confident he’s been rehabilitated and no longer needs a muzzle. If they’re wrong and the paddock ends up with more puncture wounds, don’t get mad at the dog for the owner’s bad judgment. IndyCar president of competition Derrick Walker knows Barnhart, spent time on the receiving end of Good Brian and Bad Brian as an entrant, and will play an active part in making sure Race Control is a more balanced officiating environment than the one Barnhart previously led. If I’m wrong, and IndyCar’s officiating safeguards aren’t properly implemented, stockpile all the holy water and crosses you can find. What is the definition of … INSANITY? We all will be treated to MORE WILLFUL EGO from Race Control as opposed to less. Lack of evolution and competitive maturity of the IndyCar sport – I contend, the only real aerodynamic effect that will matter in this 2015 season will be the HOT AIR of penalties emanating from the Race Control tower … not the monolithic nature found in the DW12 aero-kits manufactured exclusively by Dallara, the requested kits by Chevy and Honda (also manufactured exclusively by Dallara), and lastly, the team modified suggestions that are then fed and discussed with Chevy and Honda (also manufactured exclusively by Dallara)! Anyone have an “in” at the NSA? The depth of the point being made centers around the minor variances in the nature of the aero-kits (the vast majority of the aero-kits will be standard and dictated by Dallara as per Honda engineers during the VICS finale at ACS). 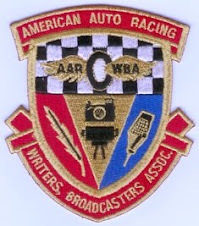 More races will be decided by Race Control with this latest appointment (based upon a well known history) than will be decided by the potential and perceived advantages provided through variances of the added aero-kits. ** Erin Campbell - Said perfectly, babe.